Children with Asperger’s (AS) and High-Functioning Autism (HFA) tend to NOT have difficulty reading, decoding language, or learning information in a rote fashion. However, they DO have difficulties that involve other kinds of learning (e.g., understanding information, relationships, ideas, concepts, patterns, etc.). This issue can be viewed as the opposite of dyslexia. These challenges are all related to the right hemisphere of the brain, and often affect the youngster’s ability in a number of areas (e.g., with organizing thoughts, physical coordination, planning, problem solving, and social interaction). The ability to recognize patterns or concepts – and then apply them to new situations – is very problematic for these “special needs” children. 1. The child on the autism spectrum often has difficulty organizing his thinking, planning and carrying out actions, and problem-solving. For example, he may struggle with breaking down an assignment into smaller pieces, or grasping the steps that need to be taken to complete a project. 2. The child with AS or HFA has difficulty identifying the main idea in something, the details that support the main idea, and the relationships among them. This affects her ability to comprehend reading, to write, to take notes, and to tell a story effectively. 3. Many children with AS and HFA are very good at rote learning. Thus, they may do well with Math simply by memorizing data. But as they get older, they often have difficulty solving more advanced Math problems that are based on recognizing patterns and concepts. 4. These kids also have difficulty interpreting nonverbal cues. As a result, they may not know what’s going on in social interactions. They don’t know what’s appropriate behavior in a given situation, because they miss the social patterns that other “typical” children pick up automatically. Problems with social communication is one reason why an AS or HFA child often focuses (sometimes obsessively) on technology (e.g., in a video game, the child doesn’t have to deal with all the nonverbal things). 5. A child on the spectrum may have difficulty understanding visual imagery. For instance, if he is asked to copy a shape (e.g., a cube), he may may draw something that appears nothing like a cube. He can’t accurately perceive the cube - or the forms that make up the cube. Therefore, he can’t copy it. 6. The child may also have difficulty evaluating visual-spatial information (i.e., has difficulty grasping the relationships between things she views, and has no clear sense of where they are). This can make her physically awkward. Allow them to abstain from participating in activities at signs of overload. Avoid assuming they will automatically generalize concepts or instructions. Explain metaphors, nuances, and multiple meanings in the reading material. Implement creative programming or a modified schedule. Minimize transitions, and give several verbal cues before transition. Never assume they understand something simply because they can “parrot back” what you’ve just said. Number - and present - instructions in sequence. Offer added verbal explanations when they seem lost or confused. Rehearse getting from place to place. Simplify and break down abstract concepts. Thoroughly prepare them in advance for field trips or any other changes, regardless of how minimal. Verbally point out similarities, differences, and connections. When they ask questions excessively, answer a couple of their questions, but let them know a specific number (e.g., “two”), and that you will answer two more question at recess or after school. 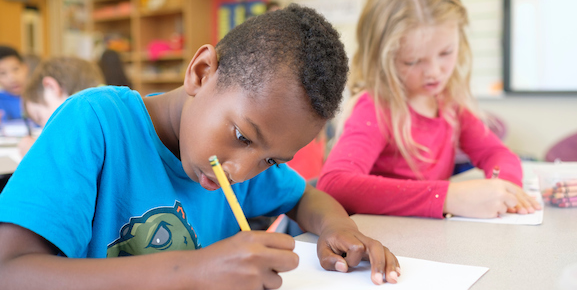 Analyze the child’s errors for clues about processing difficulties (e.g., if he reads the sentence “I pet the cat” as “I pet the car,” he may be having trouble using context clues to decipher meaning. Help the child to organize and use his time effectively. Kids on the autism spectrum often have difficulty completing daily classroom tasks. Therefore, (a) break large tasks into smaller ones, and set a short time limit for each subtask; (b) provide a folder in which the child transports homework assignments to and from school; and (c) show the child how to create “to-do lists” and establish a daily routine that he posts on his desk. Minimize distracting stimuli as much as possible. Because many children with AS and HFA are easily distracted, minimize the presence of other stimuli that may compete for their attention (e.g., ask the child to keep her desk clear of objects and materials she doesn’t need for the task at hand, pull down window shades if other classes are playing outside, etc.). Modify the child’s schedules and work environments. The problematic symptoms of AS and HFA tend to get progressively worse as the day wears on. Thus, when possible, have most challenging subject matter in the morning instead of the afternoon. Also, moving the child’s desk close to you, the teacher (where behavior can be monitored) can enhance his attention-span. Offer outlets for excessive energy. To help the AS or HFA child to control excess energy, try to intersperse quiet academic work with frequent opportunities for physical exercise. Also, give her some “settling-in time” after lunch and recess (e.g., time to read her favorite book) before asking her to engage in an activity that involves quiet concentration. Have plenty of study aids on hand. A child on the autism spectrum usually studies more effectively when he has scaffolding to guide his efforts (e.g., let the child copy - or receive a duplicate of - the class notes of high-achieving peers; provide graphics, study guides, and outlines that help the child to identify and interconnect important concepts and ideas). Teach learning strategies and study skills. Kids with AS and HFA benefit from being taught specific techniques for performing tasks and remembering subject matter. For instance, give the child questions to try to answer as she reads a story or textbook passage, teach certain mnemonics (i.e., memory aids) to help her remember particular facts, teach concrete strategies for taking notes and organizing homework assignments, and so on. Lastly, employ a variety of ways to present information. Because these children have trouble learning through a particular modality (e.g., via hearing or vision), try to be flexible in the ways you use to communicate information (e.g., incorporate videos, graphics, and other visual materials; when teaching the child how to read and spell a particular word, write the word, say its letters aloud, and have the him trace or write the word while repeating its letters).